After a couple of games past my bedtime, the Cincinnati Reds (39-61) go for their 4th series win in a row with an afternoon contest against the San Francisco Giants (60-41). With Madison Bumgarner pitching, the Reds are strong underdogs. But what do those baseball betting lines know? With everyone under the microscope of trade rumors, are teams asking the Reds about Dan Straily? 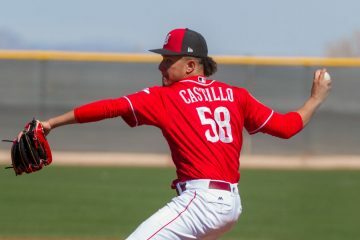 He’s been a pleasant surprise in the Reds rotation, coming into play today off four straight quality starts. The Reds have won three of those last four starts. On the one hand, Straily isn’t arbitration eligible until 2018 and is under team control through 2021. On the other hand, the peripheral stats suggest that his ERA may be due to rise over the course of the season. If there are teams interested, should the Reds sell high and make room for younger prospects within the organization? Madison Bumgarner has failed to pitch six innings in just two of his 21 starts this season. Bumgarner has also been consistently good and consistently healthy throughout his major league career. He has made 31 or starts for six consecutive seasons from 2010-2015 and is yet to miss a start this season. During that six year span, his worst ERA was 3.37 back in 2012 and his best was 2.77 the following season. Bumgarner turns just 27 years old next Monday. 1. Brandon Belt was called out at third base on a second inning tag by Eugenio Suarez. Upon further review, the call was overturned, leaving two runners on base for Matt Cain’s homerun. 2. Brandon Belt is called out again on a tag play in the 3rd inning. This would have been an inning-ending double play, but the review team determined that Phillips missed the tag, and the runner scored from third base. 3. 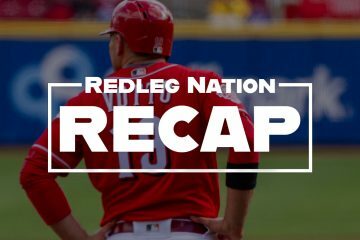 A replay review finally goes the Reds way as Hamilton was initially called out trying to steal 2nd base in the 5th inning. Hamilton stole 3rd base after the call was overturned, but was left stranded when Zack Cozart popped up to end the inning. I was surpised by this tweet yesterday, as I expected the Reds are holding out for more than one top prospect in any deal for Jay Bruce. Wouldn’t a trade of more than a season of Bruce yield more than a 3 month rental of Aroldis Chapman? The #Reds have picked up the pace on Jay Bruce trade discussions. They're talking to at least 4 clubs. Seeking a top prospect in return. Speaking of trades, yesterday I mentioned the possibility of Billy Hamilton being traded this month, too. Schebler has been playing centerfield for the Bats and has been pounding the ball at AAA. Last night, he was 5-for-5 and hit for the cycle. If any Reds outfielders are traded, Schebler will likely be up and could play any of the three outfield positions. Late afternoon baseball allows me to catch the end of the game at home. Hopefully, Straily is still on the mound throwing a gem of a game by the time I get to turn the TV on. A Field Manager that won’t play him and a General Manager that won’t send him to the minors so he can play. Day game after a night game too. The perfect time to give someone a day off. He may be better than Bruce but he is scheduled to make $20-million next year. His home/road splits are also worse than Bruce’s. He’s certainly in the mix and another option that makes Bruce’s market tougher. For some reason I think Wily Mo Puig is coming to the Reds in a Jay Bruce deal. I hope I’m wrong! Last year I would’ve jumped at him but Puig just seems to be regressing more every year. Jay is playing so well….we better not screw this up! I think Jay would resign if Bob C. really wanted to get it done! They’re not going to trade Bruce for a guy with worse numbers who is actually owed more guaranteed money than Bruce. Puig is owed 20 million over the next 2.5 years. Assuming he ” gets it together” he would be a free agent in 2019…right when the Reds are ” theoretically” able to compete….so they would’ve spent 20 million on someone who helps them be ” less bad” and likely has no impact when you’re ready to be good. He could be a great trade chip..or an utter cancer. Not worth the risk for what would likely be a modest reward that helps them beat out the Brewers for 4th place. The Reds need someone that produces in a Bruce like manner and makes 550k per year. Much like Jay Bruce in 2010. The Reds don’t want Puig. Any trade with LAD for Bruce will have to include Alex Verdugo. LA wouldn’t discuss Verdugo during the Chapman and Frazier trade talks last winter. LAD are in a different spot now than they were last winter. Reds are holding the line at Verdugo and aren’t budging. Exactly what they should be doing. They will have to pay up this time if they want Bruce. MLBTR estimates that next years Qualifying Offers will be at $16.7M. That is a lot of money to turn down. I don’t know if that could possibly play a factor in any Bruce trade talks for an obtaining team. BP could be dragging one leg like The Mummy and he’d still be in there every day but what happened to Cozart needing to sit on day games after a night game? BP may have earned the right or not earned the right but he is playing if he can walk,Its a shame to see his skills continue to decline. Look at Votto breaking up the perfect game. With a hit no less! Your Orioles are looking at Cozart. Is JJ Hardy hurt again?? He played yesterday. As far as I know, he isn’t. Nope but he’ll be 34 in August. Nice job by BP, Suarez, and Barnhart there. Just checked Gamecast. Can’t watch the game (at work) and can’t listen because AM doesn’t cut through this building. I’m telling you, Williams and/or Jocketty have got to be on the phone with the contenders who may need OF help saying “Jay Bruce could be hitting these HRs for you guys and helping you go all the way!! You don’t have a better offer yet? !” I’m assuming there have been offers and counter-offers made. Bruce is finally developing into one of the top 15-20 hitters in mlb and now we trade him…..figures! Just checked in. God bless Jay Bruce, whatever happens to him. Do not mess up the gift this young man is giving you, Mr. Jockety/Williams. (Side note, I think it’s a problem we still think Jocketty is as involved in these deals as he is. Williams should be the name out there… maybe I’m wrong and we just haven’t made the mental transition yet). No, Jocketty has been talking too much to not be still pulling the strings. Jocketty is still making the deals and in my mind that is unfortunate since Williams is the one who will have to live with the potential consequences if the deal ends up being a bust for the Reds. Will Price leave Inglesias in? Surely they don’t want to just use him for 1 out. Dusty would definitely go to Cingrani here. Another series win. Who knew that Straily could stand up to Bumgarner? I don’t trust Cingrani overall but a very nice win!! 4 series wins in a row….wow!! I think we better keep Straily too unless we can get a real prospect or 2! There are many teams in contention with 1-2 guys in their rotation that are a lot worse then him! Yay!!! Beating Bumgarner is already pretty amazing stuff!!! Straggly really did great!!! Giants ought to trade for Bruce and Straily before the Reds have a chance to leave town.